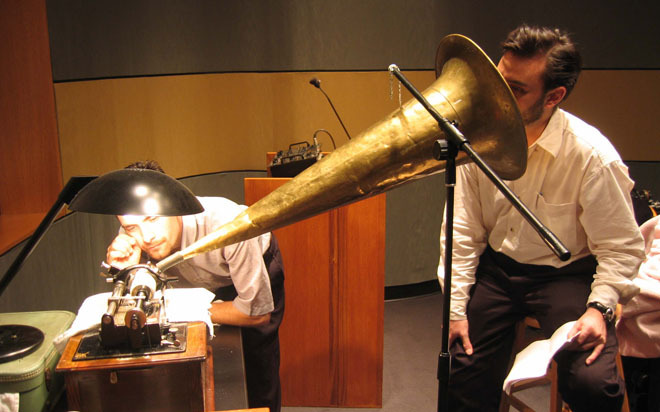 Using the classical music format of the solo recital, Pablo Helguera presented, for one night only, a programme of recent and not so recent pieces, ranging from operatic works to short slide lectures that delighted contemporary art enthusiasts and sceptics alike. The Kingston Recital included his pieces From the Vocal Archives of Florence Foster Jenkins (2000-2001) (Image 2) An Epistemological Study of Mock Turtles and their Relevance to the Development of the Avant-Garde (2001) (Image 3), Eight American Folk Songs (2002-2005) (Image 4) and Nursery (2004) with text by Luis Ignacio Helguera. Pablo Helguera (Mexico City, 1971) is a visual artist living and working in New York. His work ranges from installation to video, museum display, performance and discussion-based events. His most recent projects have been presented at the Museum of Modern Art in New York (Parallel Lives, 2003), the Eight Havana Biennial (2003) and Los del Este/Eastenders (Laurence O’Hana Gallery, London 2004). He has also exhibited or performed in Berlin, Bonn, Tokyo, Zagreb, Bogotá, Buenos Aires and Athens, and in institutions such as the Brooklyn Museum, the Karl Ernst Osthaus Museum in Hagen, the Bronx Museum, the Banff Centre in Canada, the Sculpture Center in New York, Ex Teresa Espacio Alternativo in Mexico City and the Shedhalle in Zurich. Recent works in the experimental discussion realm include the First Forum of Urban Cultural Purification (Mexico City, 2003), the First Imaginary Forum of Mental Sculpture (New York, 2004) and a re-enactment of Plato’s Symposium with an art-theory perspective (Rincon, Puerto Rico, 2004). From 1998 he has been the Senior Manager of Education of the Solomon R. Guggenheim Museum in New York. He was the director of SITAC IV, the International Symposium of Contemporary Art in Mexico City, in 2005.